Up to 90% of gout patients experience low uric acid (UA) excretion rather than high UA production. The selective UA reabsorption inhibitor lesinurad (Zurampic®) is an effective and generally well tolerated option for the adjunctive treatment of hyperuricaemia in patients with gout who have not achieved target serum uric acid (sUA) levels with monotherapy with an adequate dosage of a xanthine oxidase inhibitor, a class of drugs that acts on UA production. In phase 3 trials of lesinurad + allopurinol in adults with gout inadequately responsive to allopurinol, and lesinurad + febuxostat in adults with tophaceous gout, the addition of once-daily oral lesinurad enabled many patients to achieve target sUA levels, and improved clinical parameters (e.g. tophus number/size) in the long term. 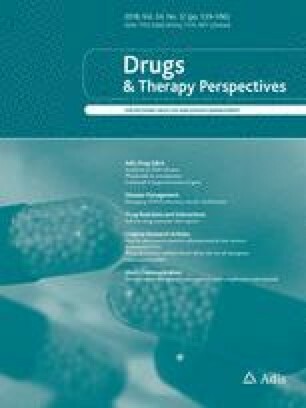 The manuscript was updated from Drugs & Aging 2017;34(5):401–1 , and was reviewed by: M. Bleckwenn, Institut für Hausarztmedizin, Medizinischen Fakultät der Universität Bonn, Bonn, Germany; A.L. Gaffo, University of Alabama at Birmingham, and Rheumatology Section, Birmingham VA Medical Center, Birmingham, AL, USA; M.J. Puszczewicz, Department of Rheumatology and Internal Medicine, Poznań University of Medical Sciences, Poznań, Poland; L. Roever, Clinical Research Department, Federal University of Uberlândia, Uberlândia, Brazil. During the peer review process, Grunenthal, the marketing-authorization holder of lesinurad, was also offered an opportunity to provide a scientific accuracy review of the data. Changes resulting from comments received were made on the basis of scientific and editorial merit. H. A. Blair and E. D. Deeks are employees of Adis/Springer, are responsible for the article content and declare no conflicts of interest. Terkeltaub R, Saag KG, Goldfarb DS, et al. Integrated safety studies of the urate reabsorption inhibitor lesinurad in treatment of gout. Rheumatology. 2018. https://doi.org/10.1093/rheumatology/key245. Klein RW, Kabadi S, Cinfio FN, et al. Budget impact of adding lesinurad for second-line treatment of gout: a US health plan perspective. J Comp Eff Res. 2018. https://doi.org/10.2217/cer-2017-0103.